Despite heavy rain and dropping temperatures, an engaged group of over 100 stakeholders—from students to urban farmers—gathered on the University of Illinois at Chicago (UIC) campus for IMAN’s annual Food For Life Forum. The event was a major step forward for IMAN’s collaboration with two UIC entities: the Department of Kinesiology & Nutrition and the Chicago Partnership for Health Promotion. Forum participants hailed from every side of the city, and examined food systems-related initiatives across Chicago and shared best practices. While IMAN has deepened its impact in this area through the Muslim Run Corner Store Campaign after years of organizing and advocacy, an increasingly holistic strategy must be developed as we work for a sustainable intervention model: everything from food procurement to land acquisition to community engagement. This Forum’s highlights included an overview of the current landscape of corner store interventions presented by Dr. Angela Odoms-Young of UIC and Dr. Rami Nashashibi of IMAN. Three breakout sessions followed, each focused on a critical aspect of sustainable food work: developing effective farm-to-table models, promoting nutrition education, and mobilizing communities toward food justice. Longtime IMAN partners from Centers for New Horizons and UIC helped lead these sessions. 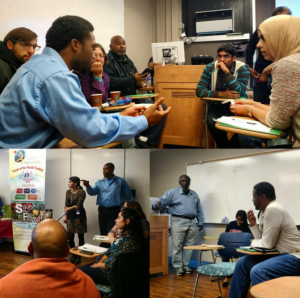 Building on the progress made at the latest Food For Life Forum, IMAN will continue to work with its allies to strengthen corner store and food-systems efforts across the city. In early December, a follow-up table discussion will deepen this conversation and refine strategies for 2016. To get involved in the Muslim Run Corner Store Campaign, please contact Manager & Lead Organizer Sara Hamdan (sara@imancentral.org). This entry was posted in One Chicago, Organizing & Advocacy, Youth Services and tagged corner store, food justice, UIC by IMAN Staff. Bookmark the permalink.